Original Editors - Iris Partin from Bellarmine University's; Pathophysiology of Complex Patient Problems project. Meningitis is an infectious disease of the central nervous system that causes inflammation of the meningeal membranes, involving all three layers surorunding the brain and spinal cord: dura mater, arachnoid, and pia mater. ; The arachnoid and pia mater become inflamed and opaque along with the first two layers of the cortex and the spinal cord. Many complications can result from this inflammation such as the increased risk of infarctions leading to blockage of cerebral spinal fluid flow, thromboses in the cortical veins and additional clinical symptoms. Meningitis can present as acute, subacute, or chronic. Viral (aseptic) and Bacterial meningitis are the most common forms of acute meningitis. Meningitis is usually a result of fungi, viruses, parasites, bacteria, or a noninfectious inflammation. Viral meningitis is less severe and symptoms can resolve without treatment. However, bacterial meningitis is a more severe form leading to numerous complications and early treatment is key. If diagnosis is delayed, this infectious inflammation can be fatal. Meningitis can be difficult to diagnose due to its similar presentations to other infectious disease such as influenza or encephalitis. The risk of developing the disease is highest in the first seven days following onset, and can persist for at least four weeks. Progression is very rapid and is distinguished by purulent CSF. Below is a picture of the meninges which are affected by meningitis. The prevalence of meningitis has greatly decreased over the last fifteen years due to the development of vaccines. The second most common bacteria that causes acute bacterial meningitis, meningocicci, is present in the nasopharynx of approximately 5% of the population. Close contact or respiratory droplets may spread the bacteria. Of the population that has the bacteria, only a small fraction develops meningitis and the most prevalent age range is from birth to one year. Individuals are more vulnerable to developing meningitis under the age of five, teenagers in their late teens or older than 65 years of age. Bacterial meningitis appears more frequently in populations that are in close living quarters such as college dormitories, military barracks, and boarding schools. Although the prevalence of meningitis has decreased, it is believed that many cases go unreported. The incidence of meningitis is 2 of 6 per 10,000 adults per year in developed countries and is up to ten times higher in less-developed coutnries. 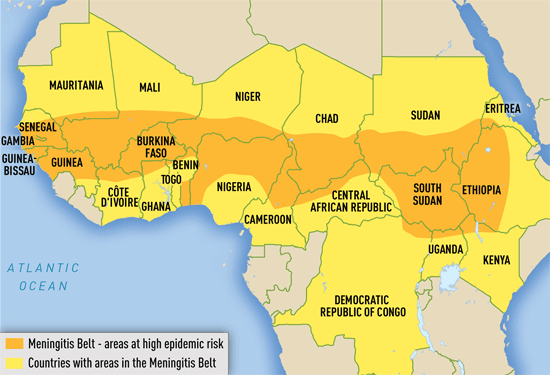 In Africa, a large recurring epidemic is reported in a region including 26 countries known as the “meningitis belt.” This region stretches east from Ethiopia to the west, Senegal compromising approximately 300 million occupants. In the United States, meningitis incidence have decreased from .3 to .18 cases per 100,00 population in 2013. Meningitis causes inflammation of the meningeal membranes; as a result nerve roots may endure tension as they pass through these inflamed membranes. Passive ROM of the neck into flexion will gradually become painful and limited. Also, neck extension and rotation may be painful as well, however not to the extent of flexion. In severe cases Brudzinki’s sign or Kernig’s may be presented. Brudzinki’s sign is caused by passive neck flexion producing flexion of the hips or knees. 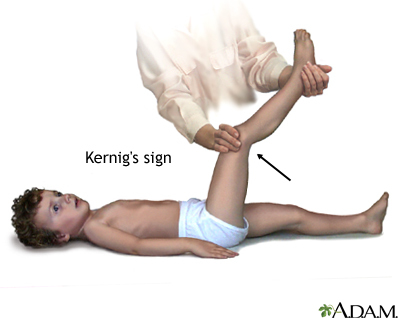 Kernig’s sign presents, as restrictive passive extension of the knee while the hip is flexed. In cases when meningitis is not treated immediately (especially bacterial meningitis), the parenchyma within the brain may be involved. As a result individuals may present with lethargy, vomiting, seizures, papilledema, confusion, coma, focal deficits, and cranial nerve palsies. Predisposing conditions of meningitis include sinusitis, mastoiditis, and otitis. These conditions may require specialized treatment. Damage or removal of the spleen increases the risk of pneumococcal disease which may lead to acute bacterial meningitis. Conditions in which an individuals immune system may become compromised increase the risk and severity of meningitis, such as HIV. Other conditions that may predispose one for meningitis include alcoholism, prior neurosurgery, cancer, head trauma, parameningeal infection, and anatomical defects of the meningies. Quick introduction of antibiotics is crucial when acute meningitis is suspected to prevent progression of the disease and increase the chance of recovery. Delay of antibiotic administration is associated with poor outcomes. If a patient presents with the cardinal signs and symptoms of meningitis antibiotics are immediately started after blood cultures are drawn. If the patient is not severely ill and the diagnosis of meningitis is questionable, introduction of antibiotics is held until results from CSF stains are determined. Once CSF gram stains are determined targeted antimicrobial treatment may begin. Duration of antimicrobial treatment is determined by CSF sterilization. Organism specific antibiotics used to treat acute bacterial meningitis may be found in Table 1. The table lists the common organisms that result in acute meningitis along with the age appropriate antibiotics. Table 1: Common antibiotics used to treat specific acute bacterial meningitis. Adapted from The Merck Manual of Diagnosis and Therapy 19th edition. In addition to antibiotics, medications to control and relieve the symptoms of meningitis are introduced as well. Alterations of CSF flow may be controlled using corticosteroids for patients with pneumococcal meningitis. Dexamethasone is suspected to be linked to reducing mortality and morbidity, hearing loss and short term neurological sequelae. Additional symptoms, nausea and headache, are controlled using the proper medications. The gold standard for diagnosing viral and bacterial meningitis is a CSF culture. CSF obtained from a lumbar puncture is used to culture cells, glucose level, protein, cell count and differential, and to begin a Gram stain. The viruses that cause meningitis are easily determined by analysis of cell protein and glucose in the CSF. Gram stains are positive 80% of the time in bacterial meningitis and are 97-100% diagnostically accurate. Lumbar punctures are performed immediately in patients with suspected meningitis to diagnose and identify the causative organism. Once the organism is identified antimicrobial pharmacotherapy may begin immediately. CSF sterilization can occur within the first 2-4 hours of administration of antibiotics. If patient presents with hemodynamic instability, increased cranial pressure, coagulopathy, or neurologic findings indicate a mass lesion lumbar puncture is contraindicated. Neonates receive antibodies via placenta for bacteria such as Listeria monocytogenes, Escherichia coli, and group B streptococcus. With age, these antibodies decline resulting in increased susceptibility especially in ages 1 to 2 for meningococcus, pneumococcus, and Haemophilus influenzae type b (Hib). Geriatric and the adult population are more affected by Neisseria meningitis and Streptococcus pneumoniae. Pneumococci infections are especially common in adults who suffer from alcoholism, CSF leaks, chronic otitis, mastoiditis, sinusitis, sickle cell anemia, pneumococcal pneumonia, and asplenia. These organisms are most commonly found in the upper respiratory tract in the mucosal layers. Aseptic meningitis is most commonly a result of a viral infection. Enteroviruses (echovirus and coxsackievirus) and herpes simplex virus are the most common viruses representing 40% of the cases of meningitis in individuals 30-60 years old and 20% of all individuals with meningitis, respectively. Individuals in late adolescence and early adulthood who develop meningitis usually came in contact with the Epstein-Barr virus (EBV). Other causes of viral meningitis include intracranial tumor rupture, mumps, systemic lupus erythematosus, radiopaque agents, lead poisoning, itrathecal drug use, and NSAIDs especially as a result of exposure during surgery. In children and infants treatment usually consist of six or more days of inpatient antimicrobial therapy followed by close follow-up outpatient management. Duration of inpatient treatment is dependant upon absence of fever for at least 24 to 48 hours, no focal findings, ability to take fluids by mouth, no seizure activity, no significant neurologic dysfunction, and improvement or stabilization of condition. Currently there are vaccines available that are highly effective and safe for some serogroups of N. meningitides, Haemophilus influenzae type b (Hib), and many types of Streptococcus pneumoniae. 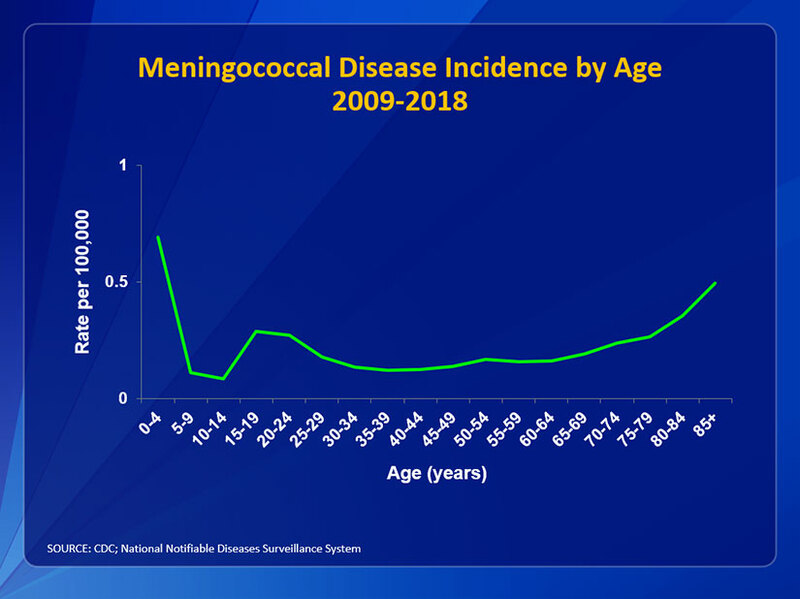 It is recommended that the meningococcal conjugate vaccine be given between the ages of 11-18 due to the increased prevalence during adolescence. The Advisory Committee on Immunization Practices (ACIP) suggests the vaccines be given as soon as possible. The ACIP highly recommends that prior to living in dormitories college freshmen should be vaccinated. The vaccine for Streptococcus pneumoniae is known as pneumococcal polysaccharide vaccine (PPSV) and is recommended for individuals between the ages 19-64 with asthma or who smoke and individuals older than 65 and at least 2 years of age with certain medical problems. Another form of the vaccine to prevent infection of pneumococcal is approved and routinely given to children younger than the age of 2. According to the American Physical Therapy Association's Guide to Physical Therapist Practice infectious disorders of the central nervous system fall under the following preferred practice patterns; 5D: Impaired Motor Function and Sensory Integrity Associated with Nonprogressive Disorders of the Central Nervous System- Acquired in Adulthood or Adolescence and 5I: Impaired Arousal, Range of Motion, and Motor Control Associated with Coma, Near Coma, or Vegetative State. Typically physical therapy treatment is initiated in the intensive care unit. While initiating a plan of care, it is crucial to keep in mind a patient’s chart information or contraindications to therapy such as intracranial pressure, cerebral perfusion pressure, and other lab values that determine rehabilitation guidelines. Meningitis may present with similar symptoms to brain injuries, neurological complications, immunological deficiency, vascular compromise, and additional secondary impairments. Additionally understanding the various stages of consciousness or behavioral changes a patient with secondary complications may go through can guide the approach to treatment. The therapist should create an environment that would ease the patient’s hypersensitivity to sensory input such as light or sound thus creating a structured environment to eliminate behavioral outbursts. Close monitoring of the vital signs will allow the therapist to gage the patient's receptiveness to therapy. The therapist should be familiar with the Glasgow Coma Scale and monitor the patient’s progression through the levels of consciousness. Proper positioning and range of motion exercise should be intiated as soon as safely possible in the acute phase. Proper positioning with pillows and towels will protect the skin integrity and prevention of contractures. Maintaining mobility of the trunk and neck are important to sustain functional mobility. The earlier therapy is initiated with a patient, the chances of secondary impairments are decreased allowing for a better prognosis. A primary key component to treating a patient recovering from bacterial meningitis is proper education not only to the patient, but to the family and caregivers as well. Providing the patient and family with education on the disease, stages of the disease, secondary complications, warning signs and resources can encourage the patient and family to become more involved in the treatment. It is very important to educate on the effects from different systemic involvement and how the time line of recovery may vary. 1. Case presentation of a 70-year-old male who presented with increasing memory disorders and 7 month history of left buttock pain, right transient temporal head pain, and right conjuctival injection who was later diagnosed with enteroviral meningoencephalitis: A Case of Enteroviral Meningoencephalitis Presenting as Rapidly Progressive Dementia. 2. A 46-year-old male presented to ER with 7 week history of headache, fatigue, and nausea as well as altered mental status over the last 2 days. Past medical history reveled an otherwise healthy individual. Cryptococcal meningitis was diagnosed. Not Your “Typical Patient”: Cryptococcal Meningitis in an Immunocompetent Patient. 3. Oitis noted as comorbitity for meningitis. Case report following a 77 year-old man who was admitted into the hospital for difficulty speaking, ear pain, fever, and altered mental status proceeding fall several days earlier. 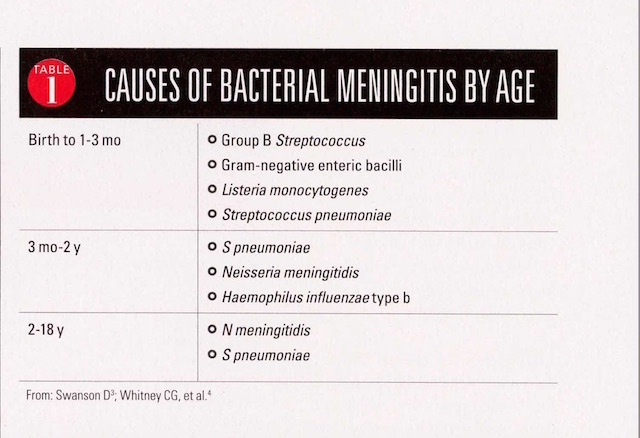 Diagnosis of bacterial meningitis given. Case 34-2007; A 77-Year_old Man with Ear Pain, Difficulty Speaking, and Altered Mental Status. ↑ 1.00 1.01 1.02 1.03 1.04 1.05 1.06 1.07 1.08 1.09 1.10 1.11 1. Goodman C, Fuller K. Pathology: Implications for the Physical Therapist. 3rd ed. St. Louis, Missouri: Saunders Elsevier, 2009. ↑ 2.00 2.01 2.02 2.03 2.04 2.05 2.06 2.07 2.08 2.09 2.10 2.11 2.12 2.13 2.14 Porter RS, Kaplan JL. The Merck manual of diagnosis and therapy. Merck Sharp & Dohme Corp.; 2011. ↑ Paul N, Bowe C, Morrow G. Bacterial Meningitis. WIN. 2016;24(8):47-49. ↑ 5.0 5.1 5.2 Goodman CC, Fuller KS. Pathology: implications for the physical therapist. 4th ed. St. Louis, MO: Elsevier Saunders; 2015. ↑ Medecins Sans Frontieres: Doctors Without Borders. Meningitis. http://www.doctorswithoutborders.org/news/issue.cfm?id=2398 (accessed 6 April 2010). ↑ 7.0 7.1 7.2 7.3 7.4 Bass III P. Deciphering Bacterial Meningitis. Contemporary Pediatrics. 2016;:14-20. ↑ 10.0 10.1 10.2 10.3 10.4 Aminoff M, Greenberg D, Simon R. Clinical Neurology. 6th ed. New York, NY: Lange Medical Books/McGraw-Hill, 2005. ↑ Watkins J. Recognising the signs and symptoms of meningitis. British Journal of School Nursing. 2012;7(10):481-483. ↑ 18.0 18.1 18.2 18.3 18.4 Goodman CC, Fuller KS. Pathology: implications for the physical therapist. 4th ed. St. Louis, MO: Elsevier Saunders; 2015. ↑ Dr. Miller. Study Guide for Medical Bacteriology. Lecture presented at; 2017 Apr 2. ↑ Valcour V, Haman A, Cornes S, Lawall C, Parsa A, Glaser C, et al. A case of enteroviral meningoencephalitis presenting as rapidly progressive dementia. Nature Clinical Practice. Neurology [serial on the Internet]. (2008, July), [cited April 8, 2010]; 4(7): 399-403. Available from: MEDLINE. ↑ Thompson H. Not your "typical patient": cryptococcal meningitis in an immunocompetent patient. Journal of Neuroscience Nursing [serial on the Internet]. (2005, June), [cited April 8, 2010]; 37(3): 144-148. Available from: CINAHL with Full Text. ↑ Samuels M, Gonzalez R, Kim A, Stemmer-Rachamimov A. Case records of the Massachusetts General Hospital. Case 34-2007. A 77-year-old man with ear pain, difficulty speaking, and altered mental status. The New England Journal Of Medicine [serial on the Internet]. (2007, Nov 8), [cited April 8, 2010]; 357(19): 1957-1965. Available from: MEDLINE.